Survivor: Cagayan (2014) - 2nd place, one jury vote. Received one jury vote to finish in 2nd place (8-1), in Episode 14, "It's Do or Die" (Day 39). Survivor: Cambodia - Second Chance (2015) - 14th place, 7th out. Voted out in Episode 6, "Bunking with the Devil" (Day 16). Cagayan Ep. 1 RC/IC: "Draggin' the Dragon" - Pulls the cart for Aparri, which narrowly finishes second (2nd*/3). Cagayan Ep. 2 RC/IC: "Phish Farm" - Swims, and Aparri passes Luzon for an easy win, thanks to Sarah on the puzzle (1st/3). Cagayan Ep. 3 RC/IC: "Mazed and Confused" - Collects and tosses water & works the maze with Cliff; Aparri wins! (1st/3). Cagayan Ep. 4 RC: "Haulin' Oats" - Sits out, as Aparri stages a last-minute comeback to finish second (2nd/3). Cagayan Ep. 4 IC: "Octopus' Garden" - Swims, dives, and watches Cliff shoot, as Cliff's basket-shooting thwarts Sarah's attempts to throw the challenge, sending Aparri to another second-place finish (2nd*/3). Cagayan Ep. 5 RC: "Kicking and Screaming" - Now with Solana, does not get a chance to participate (but does not officially sit out). Solana wins. Cagayan Ep. 6 RC: "Idol Hands" - Loses to Spencer in the first match-up, then beats him in the final bout. Solana wins, 4-2. Cagayan Ep. 6 IC: "Styx" - Helps LJ work the final puzzle, and Solana wins. Cagayan Ep. 8 RC: "Rise and Shine" - Does the puzzle (with Kass) for the losing team. Cagayan Ep. 9 RC: "Supertramp" - With Kass & Tasha on one of the two losing teams. Cagayan Ep. 10 RC: "Rove, Rove, Rove Your Boat" - Rows & works the puzzle for the losing team (with Kass, Trish, and Tony). Cagayan Ep. 12 RC: "Challenge Pitch" - With Spencer and Kass, on the winning team that delivers school supplies to local kids. Cagayan Ep. 7 IC: "Bermuda Triangles" - Outlasts Morgan and Tony in Rd.3, and Woo wins! (1st/11). Cagayan Ep. 8 IC: "Keep On Your Toes" - Sixth to drop out, at the 1-hour mark (5th/10). Cagayan Ep. 9 IC: "Living Color" - Second person eliminated, on the 2nd tile (8th/9). Cagayan Ep. 10 IC: "Hard to Handle" - Sixth out, near the start of round 3 (3rd/8). Cagayan Ep. 11 IC: "Inside Track" - Makes a strong finish, but narrowly loses to Tasha (2nd/7). Cagayan Ep. 12 IC: "Combo Platter" - One of the many people who were neither first nor second (tie-3rd/6). Cagayan Ep. 13 RC: "Mud Run" - Apparently finishes third (not officially quantitated; 3rd/5). Cagayan Ep. 13 IC: "Jacob's Ladder" - Unshown, but reaches the slide puzzle as IC ends (3rd/5). Cagayan Ep. 14 F4 IC: "Vertigo" - Third to start the puzzle stage, but all are passed by Kass (tie-2nd/4). Cagayan Ep. 14 F3 IC: "Roundabout" - Finishes a split-second ahead of Kass, and Woo wins! (1st/3). Cambodia Ep. 3 RC/IC: "Draggin' the Dragon" - Retrieves keys and swaps in on the puzzle Angkor, which loses (3rd/3). Cambodia Ep. 5 RC: "In the Barrel" - Rides the barrel, collects bags, rolls balls, Angkor finishes 2nd (2nd*/3). Cambodia Ep. 5 IC: "Air Raid" - Hits two targets for Angkor, including the final one; Angkor wins (1st/3). Cambodia Ep. 6 RC: "Slip, Slide & Score" - Now with new New Ta Keo, loses his heat vs. Joe, but Ta Keo wins. Cambodia Ep. 6 IC: "Cambodian Catering" - Wins (with Spencer) at eating tarantulas, and vs. Kimmi (pig brain), but thanks to Ciera and Kass, Ta Keo loses. *Note: Second-place finishes in the three-tribe phase of Second Chance count as half a win. Cagayan, Ep. 8: Trails Spencer and discovers an idol clue tucked into his folded pants, then races back to camp to share it with his alliance. Alas, Spencer ends up finding the idol, anyway. Cagayan, Ep. 9: LJ McKanas (voted out, 5-3-1). Cagayan, Ep. 10: Jeremiah Wood (voted out, 5-3). Cagayan, Ep. 11: Jefra Bland (voted out, 4-3). Cagayan, Ep. 12: Tasha Fox (voted out, 4-1-1). Cagayan, Ep. 13: Trish Hegarty (voted out, 4-1). Cagayan, Ep. 14 (F4 vote): Spencer Bledsoe (voted out, 3-1). Cagayan, Ep. 14 (F3 vote): Casts the sole actual vote, for Kass McQuillen (voted out, 2-1 or 1-0). Cagayan, Ep. 10: Three votes, from Jeremiah, Spencer, & Tasha. Cagayan, Ep. 14 (F4 vote): One vote, from Spencer. Cagayan, Ep. 14: Received one jury vote, from Tasha Fox (but Woo lost, 8-1). Cambodia, Ep. 4: One vote, from Varner. Cambodia, Ep. 6: Four votes, from Abi, Ciera, Kass, and Spencer (voted out, 4-3). Swimming? Sure, why not. Circa Ep1. We got a (soon-to-be-forgotten) idol clue! LJ plays his idol, too! Sarah's gone! Jefra is saved! Can we get straight to the vote? Morning 39 feast, enjoying some beef bacon, probably. They're both in! Heading to the stage. Woo wins the rice for Ta Keo! 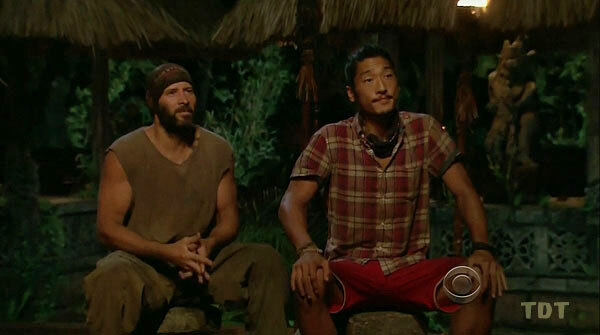 Woo wins immunity for Angkor! Rob Cesternino at RHAP (5/22/14): "Cagayan Final Four Interviews with Tony, Woo, Kass, and Spencer"
Dalton Ross at EW.com (5/22/14): "Woo explains his shocking decision and if he would do it all over again"
Gordon Holmes at XfinityTV.com (5/23/14): "Runner-Up Woo: 'I Thought They'd Vote for Kass to Spite Me'"
Josh Wigler for Parade (5/23/14): "Survivor: Cagayan's Yung 'Woo' Hwang on His Ninja Turtle Dreams"
Daniel Fienberg at HitFix.com (5/26/14): "Yung 'Woo' Hwang talks Survivor: Cagayan"
Dalton Ross at EW.com (9/5/15): "Woo says he won't make the same epic mistake twice"
Josh Wigler at Parade.com (9/10/15): "Woo Hwang Reveals His New Survivor Ninja Speed"
Gordon Holmes at XfinityTV.com (9/15/15): "Woo: 'I Need to Implement a More Cutthroat Approach'"
Gordon Holmes at XfinityTV.com (10/30/15): "Woo: 'The Doctors Said They Could Pull Me from the Game'"
Rob Cesternino at RHAP (10/29/15): "Exit Interviews with the Latest Players Voted out of Cambodia"
Dalton Ross & Courtney Yates at EW.com (10/29/15): "Woo discloses foot injury during the game"
Hobbies: Martial arts, surfing and sports (Basketball, Tennis, Soccer, Golf). If You Could Have 3 Things on The Island What Would They Be and Why? A surfboard to surf remote untouched waves in an empty lineup all to myself; A football to pass some time; and a martial art weapon (nunchaku, bo staff or katana): practicing weapons makes me feel alive! Do You Consider Yourself a Brain, a Beauty or a Brawn? I guess I could fall under any of those categories. If I had to choose one I would have to say Brawn cause of my Martial Arts Background. 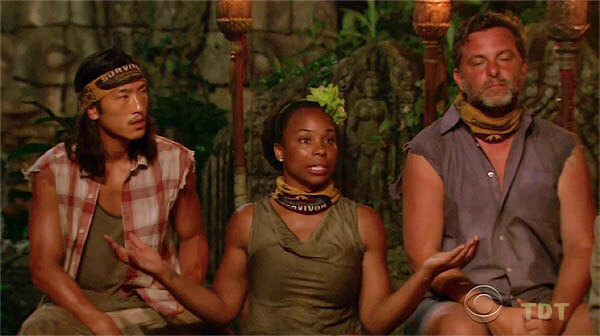 Who Do You Think Has the Best Chance in the Game of Survivor: Brains, Beauty or Brawn? That’s a tough question... I would say you want to possess all those qualities in order to win Survivor. If I had to choose one, I would say Brawn because as sports athletes they understand pressure situations of competition (composure). They have the where with all of team play, and with the structure of the game of survivor in order to advance in the game you need the help of your teammates (supportive). Brain's would fail because of their know-it-all attitudes (conflicting). The Beauties would fail because they will sit back and expect everything to be handed to them."